- A lightweight bout between Beneil Dariush and Chris Gruetzemacher was expected to take place at the event. However on October 18, it was reported Gruetzemacher withdrew from the event due to undisclosed reasons and was replaced by promotional newcomer Thiago Moises. - A women's strawweight bout between Maycee Barber and Maia Stevenson was expected to take place at the event. However on October 20, it was reported that Stevenson pulled out from the event due to injury and was replaced by promotional newcomer Hannah Cifers. - Jordan Espinosa was expected to face Mark de la Rosa at the event. However on November 4, it was reported that Espinosa pulled out from the event and was replaced by Joby Sanchez. - At the weigh-ins, Raquel Pennington weighed in at 138 lbs, 2 pounds over the over the bantamweight non-title fight limit of 136 lbs. She will be fined 20% of her fight purse and her bout against Germaine de Randamie will continue at catchweight. Main event is a great matchup. The winner's going to come out looking really impressive either way I think. Either Jung walks Yair down and pounds him out or Yair catches him coming in with something flashy. 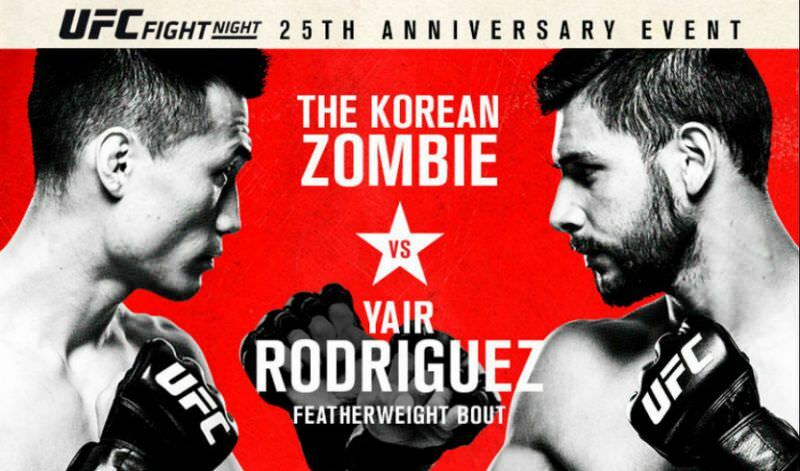 first round knockout by the korean. Clearly a bad call by the referee. Skelly was perfectly okay until the referee stepped in and grabbed his left arm, and then we saw Skelly's arm flop around (not a tap) when the referee grabbed and pulled it. The referee basically stepped in too soon. A coward dies a thousand deaths. A soldier dies but once. Cerrone with a big win that he really needed. he threw the fight obv.